Seldom can the heart and mind be more at odds than when falling hard for a boat and then inspecting it closely with a practiced eye. Although I can’t help with the palpitations, I can point you in the right direction when you evaluate whether her function lives up to her form. The first opportunity you get to see how she’ll run through the waves is when you’re walking down the dock to have a closer look. You can tell a lot about how a boat will run by its hull shape above the waterline. Looking at it from ahead, if it has a broad entry you can rest assured this is not a boat to take offshore. A full, bluff entry will ride hard in a head sea and will tend to be wet with the seas forward of the beam. Walk a little farther aft. If the chines run down below the waterline at station 4 or 5 (the hull is divided into 10 stations, station 1 at the bow at the waterline and station 10 at the transom), this is a hint that the hull has plenty of deadrise below in the forward half of the hull, where most wave impact takes place in a 25- to 35-knot planing boat. If the chines are under water as far forward as station 2 or 3, you can expect a harder ride because this indicates less deadrise below. 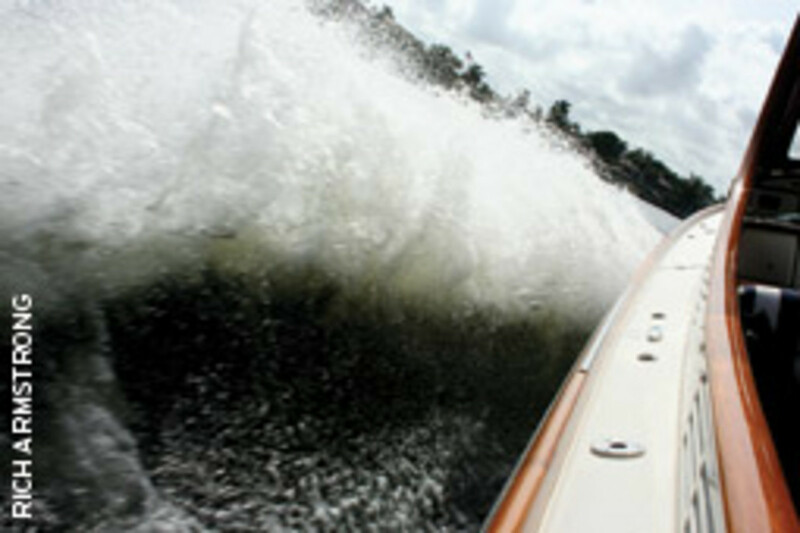 More deadrise produces a softer ride because the kinetic energy of the boat falling onto a wave is dissipated more gradually, which you feel as a smoother ride. The last thing you want to look at when it comes to judging a boat’s ride is its transom deadrise. Unfortunately, that is the one figure many salespeople know and quote when asked about the hull design. Unless you’re Reggie Fountain going 90 knots, it’s the forward half of the hull that matters when it comes to ride. A 30-knot boat with 24 degrees of deadrise will consume more fuel, be tender at rest, and will need a higher speed to get on plane. 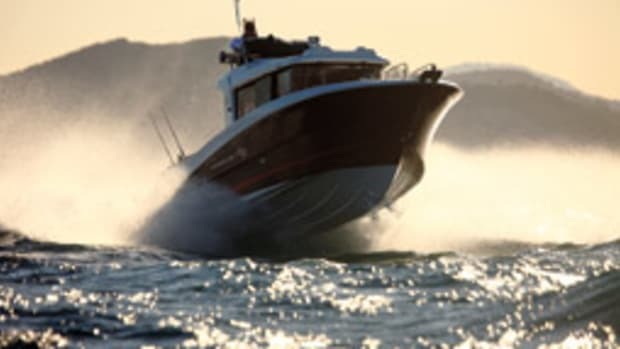 However, it’s the only way to go if you’re regularly running at 40-plus knots in rough seas, landing on the aft 30 percent of the hull every few waves. If you typically slow to 25 to 35 knots when the going gets rough and want to be able to run comfortably at semiplaning speeds of 15 knots or less in very rough water, a hull with 20 degrees of transom deadrise is more appropriate, given its superior efficiency and stability. 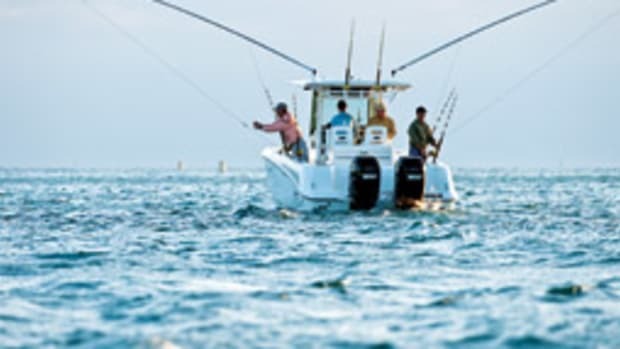 The bottom line when it comes to hull design is that a smooth-riding boat is not only more comfortable but is also safer and lets you get on the water on more days each season, adding to the boat’s value and utility. While you’re on the dock, note the boat’s freeboard. If you’re looking at one of those droop-nose bowriders, imagine how easily the bow will scoop up a wave or wake. Picture loading up the bow seating with passengers and slowing the boat quickly, such as when you’re coming up on a 3-foot wake. You’d better hope all the water that leaves the bay and enters the boat drains directly and rapidly overboard though a self-bailing cockpit’s oversize scuppers. The hull is there to keep the ocean out of the boat, so the more freeboard, the more seaworthy it is, all else being equal. A typical low-freeboard bowrider or ski/wakeboard boat is well-suited to a small lake and designed for calm water. The freeboard is low and deck water drains to the bilge since the deck is at or below the waterline. 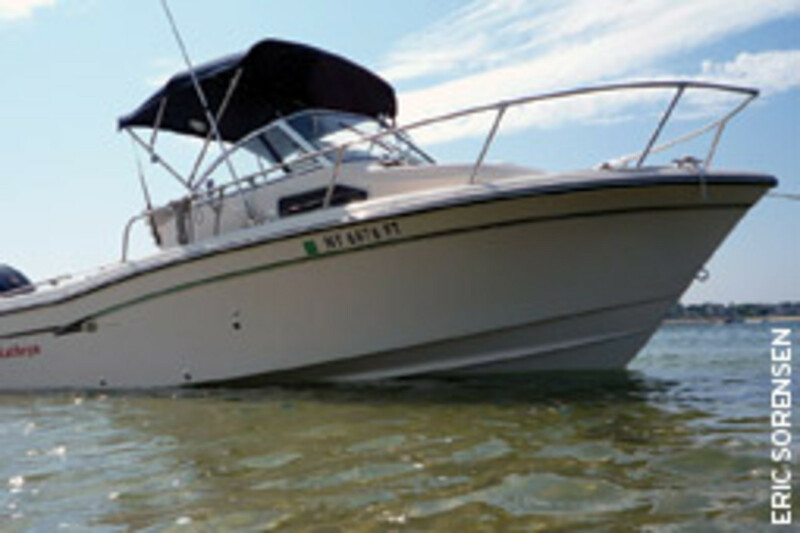 If you’re looking at a boat up to 35 or 40 feet, I would carefully consider whether it is unsinkable — whether it has enough foam injected into the hull to keep it from sinking if it is holed or a through-hull fitting fails. If the builder put in the extra work to make the boat meet level flotation standards, it has enough foam by volume, distributed high enough in the hull, to keep it afloat and upright in a swimming pool. However, do not expect even a foam-filled hull built to level flotation standards to stay upright in rough seas. No swamped boat will be able to avoid capsize because of the overwhelming upsetting moment created by the sloshing bilge water’s free surface effect. The advantage of a foam-filled hull is that someone will be able to come out and tow you back to port because some portion of it will remain above the surface for you to hang on to. The handles on the bottom of lifeboats are there for a reason — to give you something to hold on to while awaiting rescue. The other great thing about foam injected in the bilge is that it acts as a membrane to slow or even prevent water from filling the hull through a breach caused by, for example, hitting a rock. Water coming in through a crack in a non-foam-filled boat would soon overwhelm those puny bilge pumps, while foam might well slow it to a rate the pumps can keep up with. Note how easy it is to board the boat. You should be able to step aboard from a floating dock without any gymnastics. 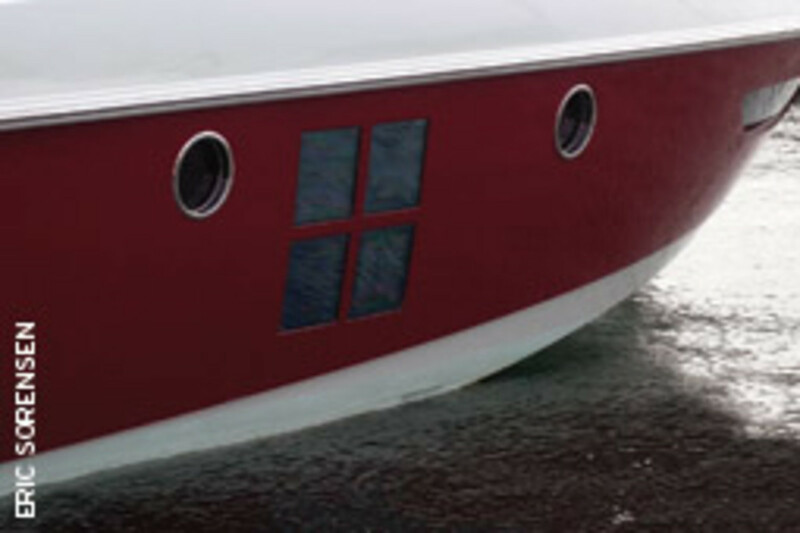 Either a side door or a swim platform with side-to access and a transom door is great, especially for older or less athletic boaters. 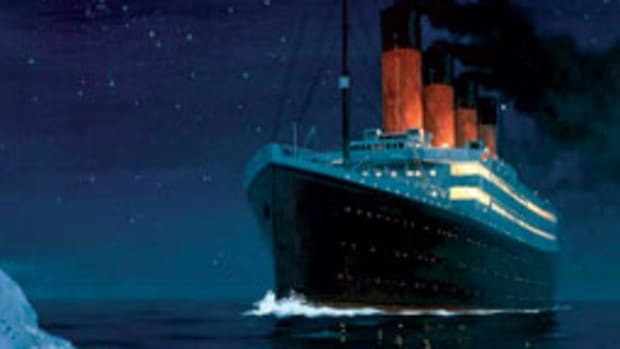 If you were to fall overboard, could you get back into the boat by yourself? Look for a boarding ladder that you can extend into the water from the boat or from the drink. It should extend three or four full steps below the surface for easier climbing. Make sure shore hookups are conveniently located. 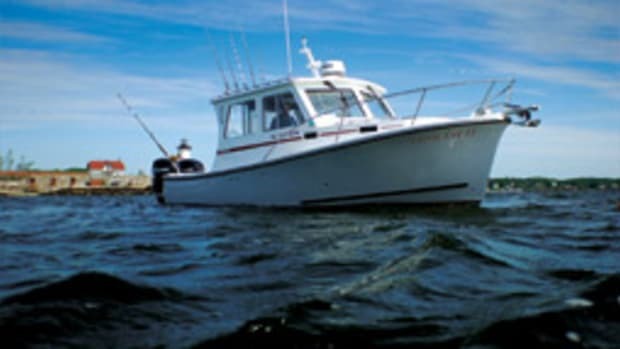 For instance, if it’s an outboard, make sure the shore power, phone line and freshwater hookups are on the same side of the boat as the transom door so you don’t have to crawl across the motor well. Be sure you can reach the stern cleats without leaving the cockpit. A number of outboard boats have the stern cleats on the aft end of the hull, outboard of the motor well, which means the line handler will be tempted — and maybe asked by the operator — to go back by the spinning props to tie up the boat, which isn’t safe. Also, make sure the cleats are big enough. A good guideline is 8-inch cleats for up to a 30-footer, 10-inch from 35 to 40 feet and 12-inch to 60 feet. Look for a cockpit coaming height of 28 to 30 inches on a larger boat, more than 28 feet, and toe kicks around the perimeter to help you keep your balance when leaning against the coaming — or washboards if you spend time on lobster boats. Scuppers should be large, at least 1.25 inches in diameter if they drain through a hose. Hatch gutter drains should also be that large so they don’t clog with debris or fish scales. Imagine the deck with a foot of water in it and how long it would take to drain and how easily the drainage system might clog. If there’s a transom door, I like the outboard-swinging variety because you can more easily get it open to help drain a deck full of water. Also, measure the height of the deck to the waterline. If you’re on a 30-footer or bigger with a deck that’s just 2 or 3 inches above sea level, you’ll have precious little reserve buoyancy when you need it. Keep in mind that scuppers can drain water out of the bay and into the boat if the deck is submerged below the waterline — for example, when the deck is low to start with and you end up with too many fish and people aft. The higher the deck, the more reserve buoyancy, and the faster the water will drain under extreme conditions. 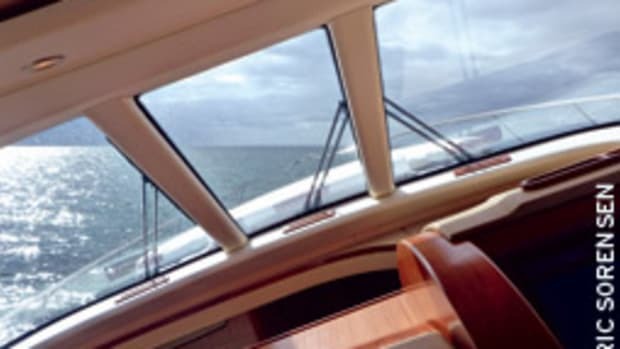 My guideline is a minimum of 8 inches of cockpit deck height aft on a boat 30 feet and up, and a foot is better, since deck height plays a big role in how fast — and if — your deck will shed water. 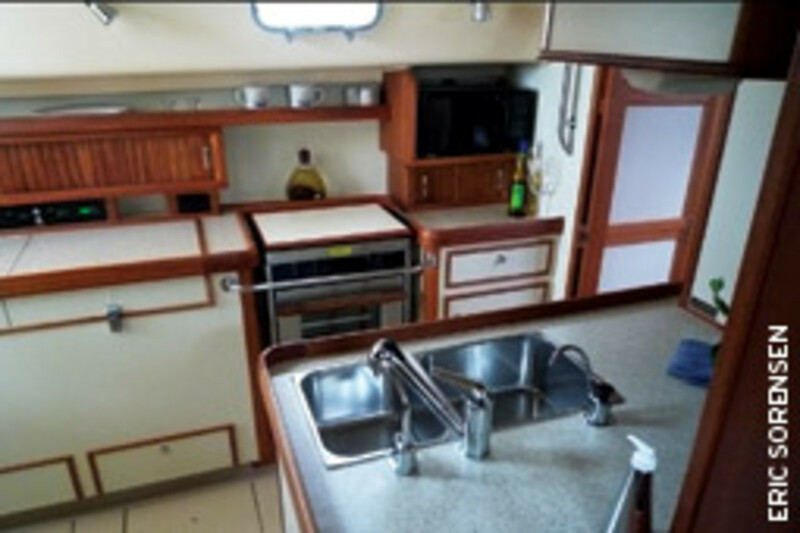 Both the bilge aft on an outboard and the lazarette and engine room on an inboard should offer comfortable access to the mechanical components. You should be able to get to both sides of both engines and the generator and, at the very least, be able to comfortably reach the oil dipstick, fuel filter/separators, raw-water strainers, seacocks, freshwater expansion tank fill and all other routine maintenance points. The fuel tank and engines should be removable without using a saw, with hatches provided for change-out when needed. If you have to cut the cockpit up to get to the fuel tank, figure on paying three times as much to replace the fuel tank and losing use of the boat for a much longer period. You’ll see a lot of no-wood, no-rot advertising at boat shows, but I’ve seen all-composite, wood-free boats suffer catastrophic failures, such as decks coming loose from stringers and hull skins peeling off the bottom. I’ve also seen pressure-treated plywood (the green kind that you can bury in dirt without ill effect) reinforced hulls go for 20 years without trouble. The lesson is that there are many good ways to build a boat and just as many ways that produce unsatisfactory results. There is a wide range of acceptable boatbuilding methods and materials, and there are costs and advantages associated with each. The foam traps moisture against the tank, which can cause corrosion. My advice is to avoid boats with foamed-in fuel tanks, whether aluminum or another material. Rather, look for aluminum tanks that are installed with room for air to circulate all around the outside, so any water that gets on the tank will drain away. 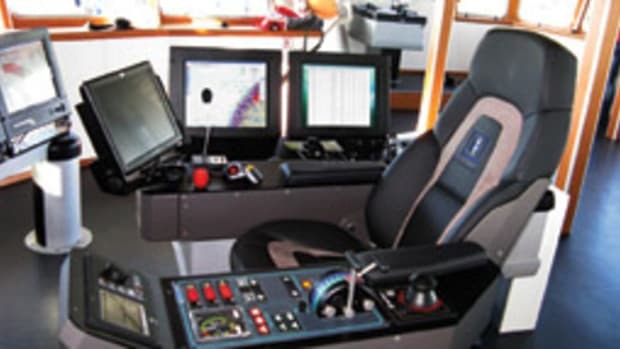 There is no area of a powerboat that is more important yet more neglected by many builders than the helm station. Fashion usually drives the design bus, with the result a confusing mess of gauges, switches and electronics. For example, the port engine temperature gauge is two or three feet away from the starboard engine’s gauge, when ideally they would be arranged vertically in a pair so you can see early on when one engine starts having trouble. For an idea of what the ideal helm station should look like, your car will be instructive as far as reach and sightlines go. Even better, take a close look at the driver’s position next time you ride a bus. Controls should be comfortable to reach and use, electronics at arm’s length, gauges in clear sight. Sitting at the wheel, you should be able to see over the bow without interfering decks or electronics consoles. Window mullions should be a maximum width of 2 to 3 inches, since the goal is to be able to see the horizon unobstructed without moving your head. If the boat has a 20-inch-wide radar arch or one of those horizontal, sweeping Euro-style fiberglass panels between upper and lower side windows, then walk away before you get hooked on the ostrich skin settees and burl elm woodwork. Or if there are curtains back aft with more canvas than plastic windows, keep in mind that your situational awareness will be diminished. The less you can see around you, the less safe you and your family will be out on the water. 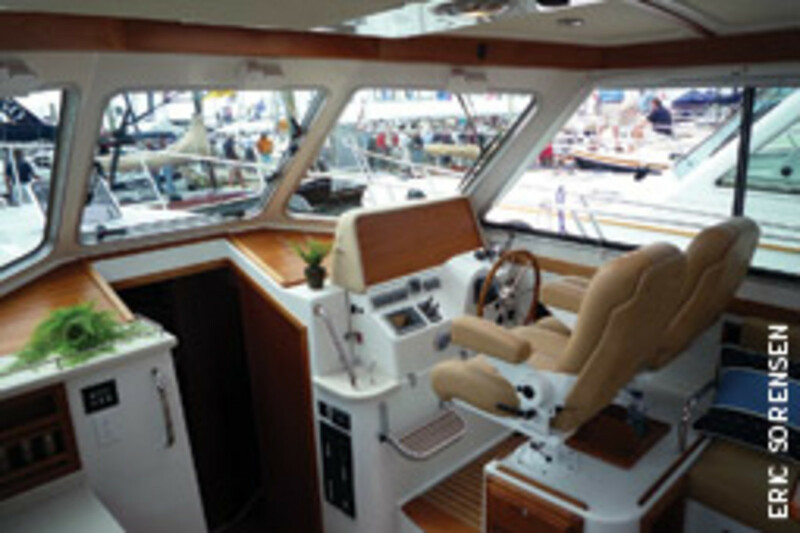 When I get involved with a pilothouse design, my philosophy is to start with an unobstructed horizon, as if sitting on an open flybridge, and then require that the only impediments to visibility are structural elements, such as windshield and side window framing, which by the way never have to be more than 3 inches wide if your builders know what they’re doing. Although the marketing materials might claim the boat sleeps six, it might only be true if everyone in the family is younger than 12 years old. Be sure to bring a tape measure to find out how long the berths are; 80 inches is ideal, and less than 76 is too short. Measure the headroom. This depends on boat size, but 80 inches is great, and less than 72 inches is pretty much unusable — and watch for low headroom at the companionway. While you’re measuring, the companionway should be a minimum of 20 inches wide; 24 inches is terrific. Be sure you can comfortably walk down the stairs to the cabin while facing forward. Many stairs are too steep, small and slippery to do so safely. 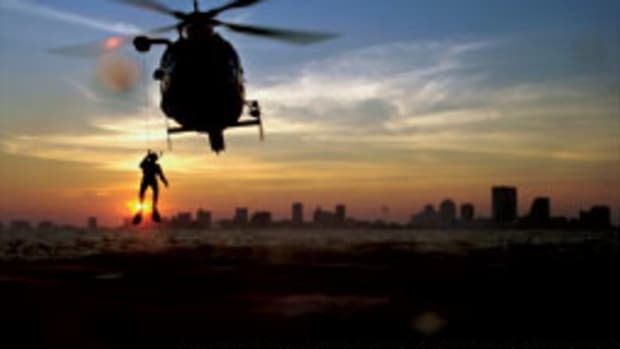 The hatch overhead is there to let in air and sunlight — and, more important, to let you out in an emergency. Look for a hatch that’s a good 19 inches across inside — bigger is better — and be sure your largest family member will be able to escape through it. Also, there must be a way to get up and out the hatch, either by stepping on a berth or table, or with a fold-down ladder provided by the builder. If the boat has a midcabin, make sure you can get in and out of the berth without strain and that you don’t feel claustrophobic inside. If the boat has those cute bowl-shaped sinks, expect them to spill their contents when you hit your first sea heading offshore. Vertical-walled sinks are more spill-resistant and, therefore, more practical. Being able to see the horizon when standing at the stove makes things much more pleasant than a windowless cabin. Step inside the head and make sure you can sit and stand with plenty of elbow room. Check whether all surfaces are fiberglass for easy cleanup and to prevent mildew and rot. The drain should be on the downhill side of the deck; it sometimes is not. 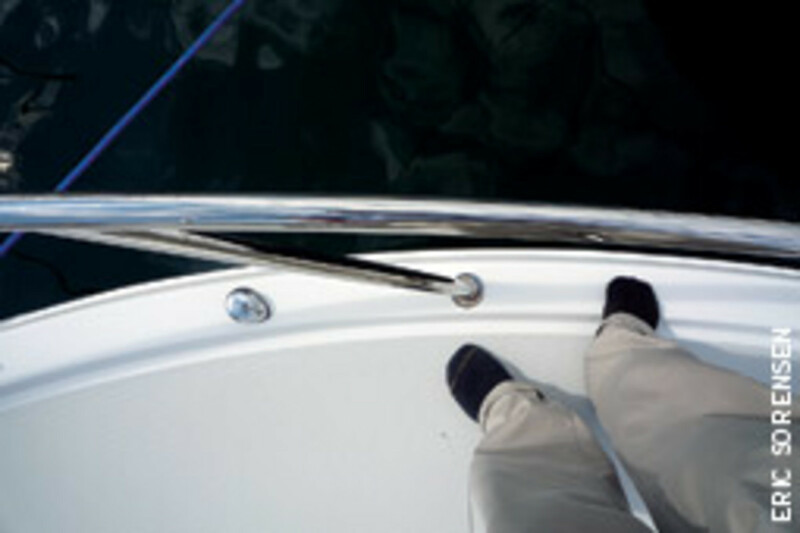 Make sure the side decks are wide enough to safely walk forward to the anchor. Look for bow rails that are at least 28 to 30 inches tall and are strong and stiff enough to lean on. They should be directly above the outboard edge of the walkway to the bow, not project outboard of the gunwale, or forward of the stem or pulpit. In other words, you should be able to lean your thigh against the bow rail anywhere without being off-balance. 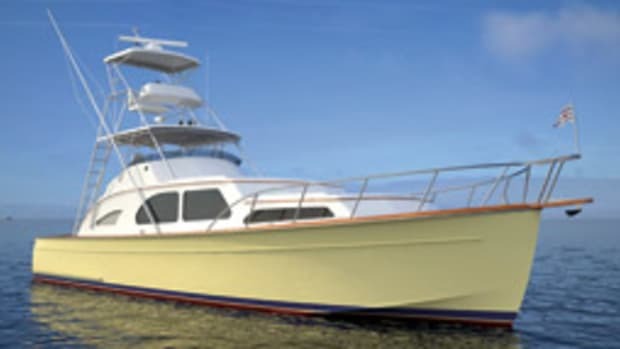 The foredeck walkway forward should be reasonably level; the worst combination safety-wise is the express cruiser with a sloping ski-jump foredeck and a 20-inch bow rail, which is just high enough to catch and break your leg when on the way overboard. Go through the motions of tying up the bow line and dropping the anchor to see whether it can be done safely. Remember, the worst place to fall overboard when moving ahead is the bow, but few boats are designed to keep you safe up here. There’s much more to consider when buying a boat, but this is a good start. And above all, be critical. If you own a pod-powered boat — Zeus, ZF or Volvo Penta IPS — I’d like to hear from you. Send a note to eric@ericllc.com and let me know about your experiences, good or otherwise, including reliability, cost, availability and quality of service, repair issues, and whether you’ve run aground or damaged the pods and what the outcome was. Eric Sorensen is a consultant to boat- and shipbuilders, boat owners, and to the government. He was founding director of the J.D. Power and Associates marine practice and is the author of “Sorensen’s Guide to Powerboats: How to Evaluate Design, Construction and Performance.” Eric can be contacted through his website, www.ericllc.com.